Drożdżówki z serem or cheese buns in English are traditional Polish semi-sweet pastry made from super soft yeast dough that is filled with sweet vanilla cottage cheese mixture. They are often also sprinkled with crumbs or blueberries but we decided to top them with some leftover mini Easter chocolate eggs instead. To make the dough combine lukewarm milk with sugar and yeast, leave aside untill it will double the size. Then share the dough into 24 equal pieces, turn each piece into roll and then twist two pieces together. Roll each twist into snail like round shape while placing on the baking tray, tucking loose ends under the buns. Again, leave to buns grow for about 30 minutes. Top the holes with cheese mixture. Half way though the baking brush the dough part of the buns with egg yolk, return them to the oven. To prepare the glaze mix icing sugar with milk, place in a piping bag, cut of the tip and drizzle over the buns. Before the icing will set top the cheese buns with chocolate eggs and let them cool down properly before serving. Replace chocolate eggs with some other decorations for Christmas, birthday parties and other occasions. If you have any cheese mixture left, you can make mini cheesecake. Pictured bunny has been needle felted by me and the cute crystal jar came from Ball. I’m adding this recipe the Inheritance Recipes challenge that we co-host with Solange of Pebble Soup. 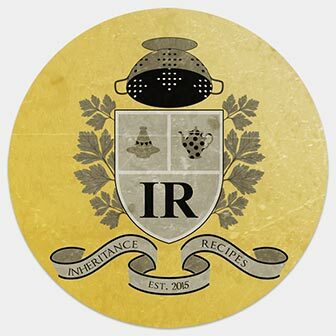 April Inheritance Recipes is hosted by Solange, please come and join us, share your inherited recipes! I’m sending this also to Dominic’s from Belleau Kitchen Simply Eggcellent event. They were delicious… To my surprise (as I’m not very good with yeast dough usually) they came out perfectly soft, just like I remember from my childhood. Ooooh I just fancy one of these for my breakfast! Delicious! I love Polish recipes, so many are like big food hugs! This looks delicious, a great way to use up leftover easter eggs! What a lovely way to use up leftover Easter chocolate. My hubby would love these as he’s a massive pastry and bun fan. Oh, I relly, really love this idea. I might just have to borrow it to make with the kiddoes. Yes, please do try it.